Carve a marionette by John Roberts. At last, after over a year’s work, my book is available to buy. Only a few hundred copies are bring printed, so do not delay ordering. 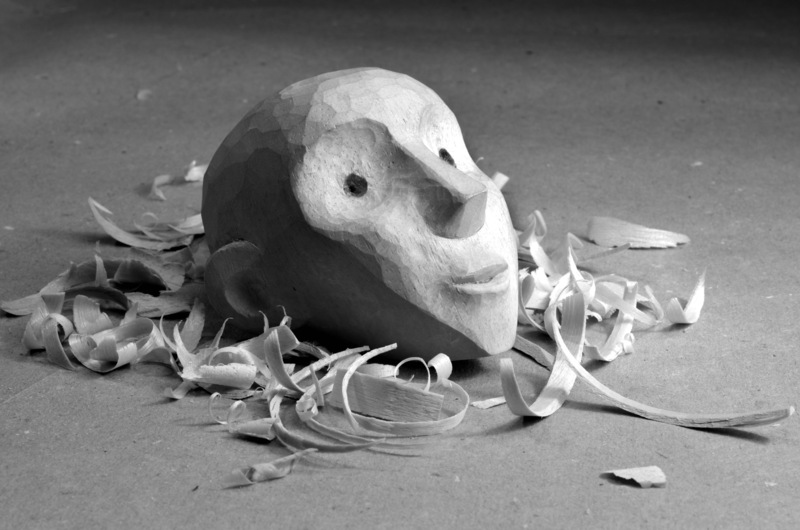 This is a step-by-step guide on how to carve a wooden marionette. Detailed instructions, illustrations and photographs show the design, carving, jointing and stringing of a human-shaped marionette. The aim is for the reader to make a beautiful puppet that works really well. The puppet is made using traditional, tried and tested materials and techniques that can be used to make different sizes, styles and types of puppet. Making a carved puppet in this way is enjoyable, challenging and rewarding. Principles of designing a wooden marionette. What tools and materials are needed. How to use chisels safely and get them super-sharp. How to refine and paint the puppet, put it on strings and bring it to life. Ideas on costume, hair and eyes. It is a book to use in a workshop. Thick paper pages in a 2-ring binding, so the pages will lie flat when opened, and can be removed for easy use. You can add your own pages of notes. A hard cover and spine, so it can be put on a bookshelf without collapsing. Cover size: about 25cm x 20cm (10 inches x 8 inches). 180 pages with 670 black and white photos, 14 colour photos and 78 drawings. Page size is just over A5 landscape, which is a good size to fit on a bench. I have tried to keep the cost down, but the numbers of pages have increased from 150 to 180, the paper has been increased to be a heavier page to make it robust enough for workshop use, the cover has grown in size and there are a few pages in colour. I am pleased with the end result. I hope you will be too. I have been wanting to write this book for around 30 years and at last it is done! I wish I had had a book like this when I started making puppets. John is renowned as a skilled maker of finely crafted puppets, with a particular interest in marionettes. For ten years he was a director at the famous Little Angel Theatre in London, touring around the world performing at festivals and seeing the best contemporary and traditional puppetry. In 1986 he became the first non-Chinese person to train in making and performing in China at the amazing Quanzhou Puppet Theatre. He is director/founder of Devon-based puppet troupe PuppetCraft. For over 30 years John has taught puppet carving to adults. Cost: £40 + post & packaging. Europe, including Rep of Ireland: £18. USA, Canada, South America, Africa, Asia, Australia or New Zealand: £22. ⬜ Book to be picked up from PuppetCraft, 1 Venton Oak Cottages, Dartington, Totnes, Devon, TQ9 6DW. (Email to make arrangement to pick up: admin@puppetcraft.co.uk) £40. ⬜ Book posted to UK: £40 + £8 p&p= £48. Postage takes about 3 to 6 working days. Signed for. ⬜ Book posted to Europe, including Rep of Ireland: £40 + £18 p&p= £58. Postage takes about 3 to 5 working days. Tracked and signed for. ⬜ Book posted to USA, Canada, South America, Africa, Asia, Australia or New Zealand: £40 + £22 p&p= £62. Postage takes about 5 to 7 working days. Tracked and signed for. I will post the book to you within 1 week of you placing your order. You will be sent an email notifying you of the expected delivery date. Get PuppetCraft’s latest posts direct to your inbox!